The interstate highway system is a great way to get somewhere fast. But sometimes it's worth taking a road less traveled to experience something new and unexpected. U.S. Highways 6 and 34 share a stretch of road well south of Interstate 80 in southwest Nebraska where you'll find two small-town golf courses waiting to be discovered. 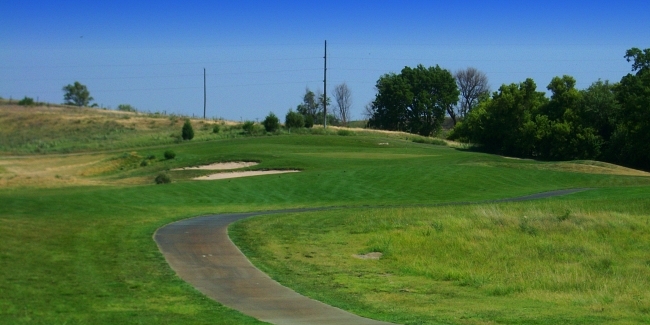 The rugged terrain in McCook provides a scenic setting for a course that Nebraskans know well. Heritage Hills takes golfers on a rollercoaster ride of elevation changes, blind shots and dry, desolate ball-eating brush. It's a challenging course, but it's a challenge that's fun to take on. The landscape might remind some of the desert southwest, and the course has some beautiful holes. It's best to take a cart, especially if you're playing Heritage Hills for the first time. Drive ahead to figure out your line on blind shots. It's a risk-reward type of course that offers golfers an opportunity for a good score if they can hit their targets. The course is well cared for and boasts lush fairways and fast, undulating greens. Native grasses, brush and bunkers pose problems for shots that venture off course. Heritage Hills is a unique golf experience for Nebraska, and at $35 plus cart for 18 holes, it's affordable as well. Just a short drive east of McCook is the village of Cambridge, home to Cross Creek Golf Links. Cross Creek combines a traditional parkland course with links-style holes, giving golfers a diverse golf experience. Measuring more than 7,200 yards from the back tees, Cross Creek is Nebraska's second-longest course. But you don't have to be a long hitter to enjoy the layout. Five sets of tees make Cross Creek manageable for players of all abilities. The front nine starts with a traditional tree-lined par 4 before moving across the creek for links golf. One unique feature is back-to-back par-5 holes. Wide fairways and big greens give golfers an opportunity to score well, but native grasses and bunkers must be avoided. The back nine features a tough stretch of holes as you're heading home. No. 15 is a sharp dogleg right that's tempting for big hitters. A well-placed drive from the elevated tee could get you close to the green, but anything short of the fairway will be tough to find in the native grass. No. 17 is a risk-reward par 5 with a split fairway. Gutsy golfers choose the left side, with a direct but narrow path to the green that's reachable in two. The right side has more room, but it's a dogleg left and you'll need to lay up with your second shot because of bunkers guarding the green. Cross Creek is a fun course to play and very affordable at $35 plus cart for 18 holes. Together, Heritage Hills and Cross Creek make a great one-two punch for golfers looking for something a little different. Both courses participate in the Play the West and Southwest Nebraska Swing promotions. You can learn more about Nebraska golfing opportunities at VisitNebraska.gov/golf.